Coming for the waterpark? View our hours. The Waterfront at Bridges Bay Resort includes all the things necessary for a perfect Lake Okoboji vacation. Enjoy our dining at Waters Edge American Grille and Bracco Waterfront Grille and Island Bar. Grab a quick bite at Blue Water Flatbread Pizza Company or Pickled Parrot Waterpark Cantina, and enjoy the zipline, outdoor pool and swim up bar. Not only do we have all the amenities on site, but we are conveniently located only a short walk or bike ride to Arnolds Park Amusement Park. We invite you to explore the expanded Bridges Bay Resort. Soak up the sun and enjoy a cocktail by our outdoor pool and swim-up bar. Join us during your stay or make a day trip! Boji Splash is the only indoor waterpark in the area. Our biggest draw is our waterslides and whirlpool for adults, but there’s so much more. Join us during your stay or make a day trip! 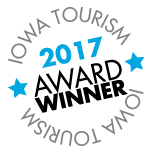 There’s so much to do when you stay on East Okoboji Lake in Arnolds Park, IA. Learn about on-site amenities at Bridges Bay Resort, and see what’s happening nearby. Open all year long, Blue Water Flatbread Pizza Co. serves up thin-crust pizza, baked to perfection. Bracco Waterfront Grill and Island Bar brings you a taste of the tropics with its vibrant outdoor atmosphere, exotic drinks, and Caribbean-inspired cooking. Coming to Boji Splash Indoor Waterpark at Bridges Bay Resort? You can enjoy snacks, including tropical drinks and flatbread pizza right in the waterpark. At the Waters Edge American Grille, you’ll also find fresh seafood, stuffed crêpes, and cracker-crust flatbread pizza crisped to perfection.